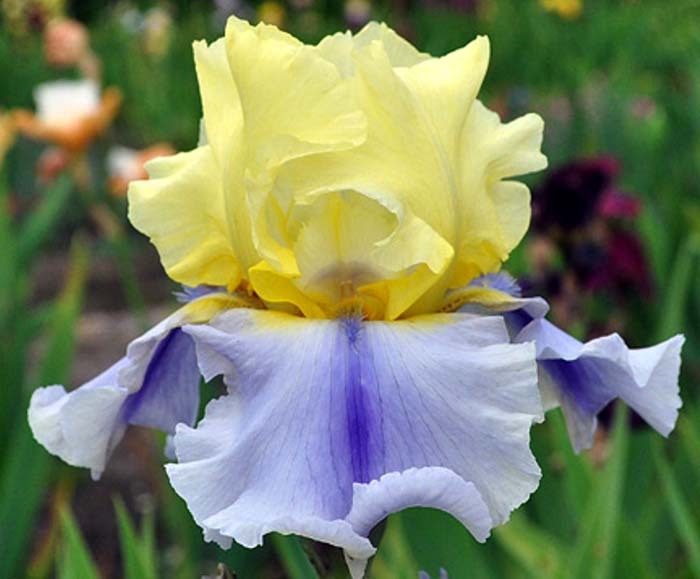 From Keppel Iris catalog, 2011: EASTER CANDY EML 37" (Haut les Voiles X Bollywood sib) Done in soft Easter colors: light yellow standards, pale lavender blue falls with a more deeply colored vertical central wash giving it distinction. A touch of yellow on the hafts plus beards that change from lavender to yellow help unite the flower parts visually. Multi-branched stalks (up to four branches with the lowest rebranched) can carry as many as a dozen buds, giving an unusually long bloom season. Domed standards and semi-flared falls are all gently waved and ruffled. #04-62B. $50.00; 3 for $135.00. JPG EasterCandy01.JPG manage 146 K 12 Mar 2016 - 17:31 Main.TLaurin Photo by Tara Perrenial Farm-Owen Sound,Ont. JPG eastercandyabg.JPG manage 44 K 03 Mar 2013 - 01:50 Main.TLaurin Taken at the 2012 AIS National Convention, Ontario, CA.